The Braves watched a five-run lead disappear, but still managed to complete their three-game sweep of the Marlins in extra innings. 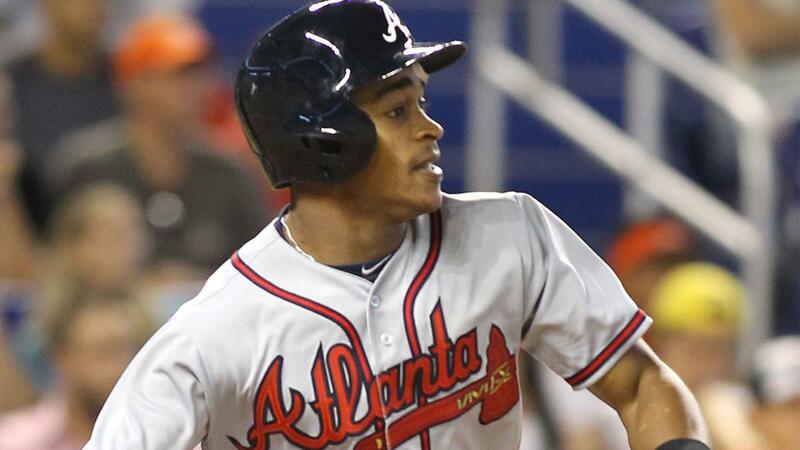 Mallex Smith's two-out, RBI single to center off Edwin Jackson proved the difference, as Atlanta prevailed 6-5 in 10 innings at Marlins Park. Ichiro Suzuki's two-out, RBI single in the ninth inning off Jason Grilli pulled the Marlins even, but with two outs in the 10th, the Braves countered and went ahead on Smith's single to center. Miami has now dropped four straight and fell to 0-5 at home. Atlanta is now 28-12 all-time at Marlins Park. "He had a tough game offensively until that point," Braves manager Fredi Gonzalez said of Smith's only hit of the game, which gave him his first career RBI. "But the kid battles and he's got confidence in himself, and good for him." After falling behind by five runs in the sixth inning, the Marlins chipped back with three in the sixth, one in the seventh and eventually forced extra innings thanks to Suzuki's single in the ninth. Braves right-hander Jhoulys Chacin, staked to a four-run lead in the first inning, retired the first 10 he faced before Martin Prado's single with one out in the fourth inning. The right-hander even helped his cause at the plate with an RBI single in the sixth inning, extending the lead to 5-0. The Braves stacked their lineup with seven left-handed hitters against right-hander Jarred Cosart. They struck for four runs in the first inning off Cosart. Nick Markakis started things off with a double. Freddie Freeman had an RBI single, but the big blow was Jace Peterson's three-run double with two outs. "Obviously, the first inning, it really hurts us," Marlins manager Don Mattingly said. "But you just couldn't stop the bleeding there. You're trying to get out of that inning there. The first inning is always dangerous for your starter. Then I thought he did a really nice job keeping us in the game." Chacin delivers: Despite allowing his first three runs of the season, Chacin had a solid outing. He allowed four hits and recorded six strikeouts in a 5 1/3-innings outing and had a one-hit shutout working through five innings, before the Marlins rallied for three in the bottom of the sixth. The right-hander contributed to his cause at the plate with an RBI single in the top of the sixth that stretched the Braves' lead to 5-0. Cold start, warm finish: Things got out of control quickly for Cosart in the first inning, as the Miami right-hander faced nine batters, threw 34 pitches and allowed four runs. Cosart labored with command, walking three. In the second inning, Cosart walked two more, but he settled in and ended up giving Miami several quality innings. Cosart had a stretch where he retired 12 straight and got into the sixth inning before he exited following an RBI single by Chacin. The final line wasn't pretty for Cosart, who allowed five runs (four earned) with six walks and four strikeouts. "It was a bad first inning. Too many pitches," Cosart said. "Just didn't have a clue of where anything was going. But I'll take the rest of it." Quick out of the gate: The Braves gave Chacin a 4-0 lead before he threw his first pitch. Markakis continued his hot hitting during this series when he lined a leadoff double down the left-field line to spark the offense. Back-to-back walks with two outs after Freeman drove in Markakis with a single set the stage for a bases-loaded three-run double by Peterson. Ichiro building legacy: Ichiro entered in a double-switch in the sixth inning, and he made an impact with his bat and legs. The 42-year-old had two singles, including the game-tying hit with two outs in the ninth inning off Grilli. In the sixth, Ichiro singled, stole second and scored. With his two hits, Ichiro is now 61 away from 3,000. And his stolen base was No. 499 in his career. In MLB history, only Ty Cobb, Honus Wagner, Paul Molitor, Eddie Collins, Rickey Henderson, Lou Brock and Barry Bonds have had at least, 2,900 hits and 500 steals. Ichiro's sixth-inning single was hit No. 2,939 of his career. He is now four hits shy of Frank Robinson (2,943) for 33rd place in MLB history. The Braves scored the go-ahead run in the 10th inning on Smith's two-out single, but a potential second run on the play was called out at the plate. Peterson attempted to score while Smith was in a rundown between first and second. The initial call on the play was that Peterson was tagged out by J.T. Realmuto. Atlanta challenged, but the call was confirmed after a review of 1 minute, 24 seconds. Braves: After an off-day Monday, the Braves had planned to send right-hander Matt Wislerto the mound in the first of a three-game homestand against the Dodgers, but Wisler (0-1, 4.97 ERA in two starts this season) was needed out of the bullpen in the 10th inning Sunday and it's now possible that his next start will be pushed back a day or two. Former Braves left-hander Alex Wood (1-1, 4.50) is the scheduled starter for the Dodgers. Marlins: The Marlins and Nationals split two games in Miami's first road trip. On Monday, the Marlins open a four-game series with the division-rivals from D.C. Jose Fernandez (0-1, 5.06) seeks his first win. Tanner Roark (1-1, 2.45) goes for Washington. Fernandez is 3-0 (0.98) in six career starts against the Nationals.